Hope you and your family had a wonderful Christmas and happy New Year! Just a quick note to tell you how much we are loving Lucy! She is really a dream- doing so great with crate training, sleeping through the night and just so super sweet and fun! We are absolutely in love with Scout! We made the trip all the way from California to pick her up and every step of the adventure has been so worth it. She is just the right mix of sweet and spunky. When she’s home with us she loves to cuddle and hang out. Outside she romps and plays with great enthusiasm - she especially loves to fetch sticks and balls. Sandy, Bob, Dylan and of course Scout! 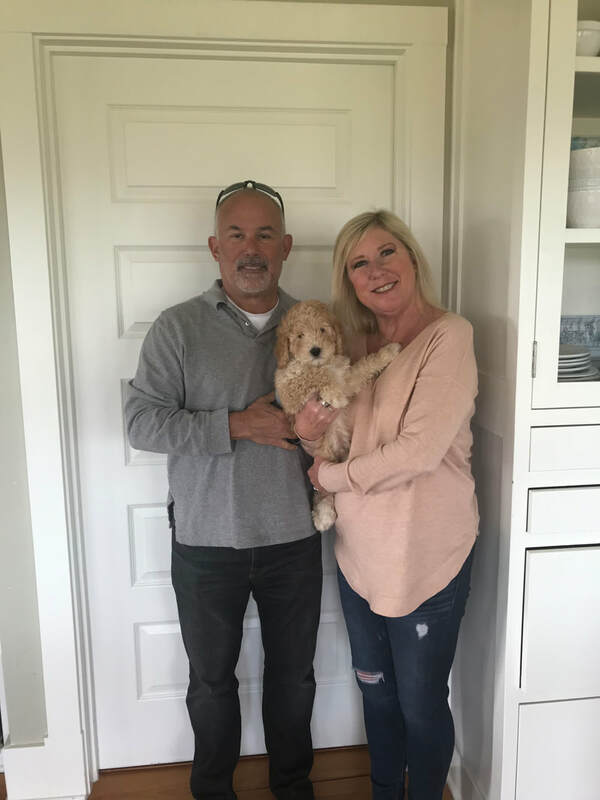 Thanks again so much for everything; your house and farm and family are lovely and we are so very excited about Maple's purple pup - we've named her Ziggy! I also wanted to thank you for the initial instructions; We had a great ride home, she's already sleeping through the night, can sit on command, and she's rung the bell twice now to go outside for a potty break. 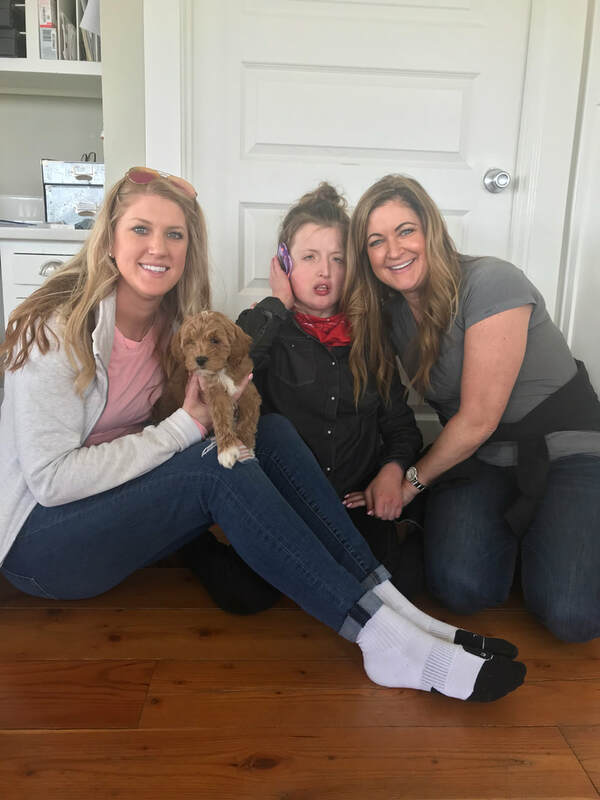 She is a such a sweet and special pup and we love her very much - thank you for her! 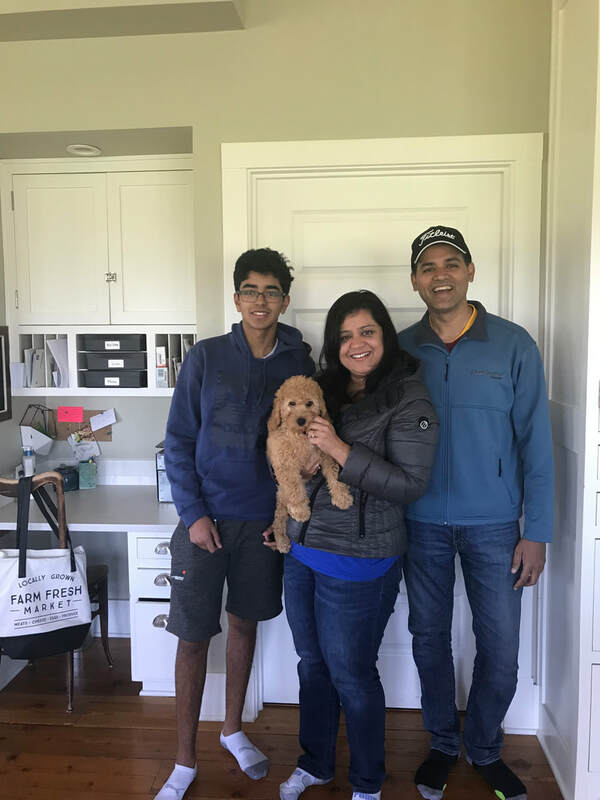 Nahla (Clover's puppy), our Australian Labradoodle, has brought us much happiness and joy to our family. She is 35 pounds which is a great size for us. She has curly, fluffy, soft-apricot-coloured hair. She doesn't shed which is wonderful to us since our son is allergic to shedding breeds. 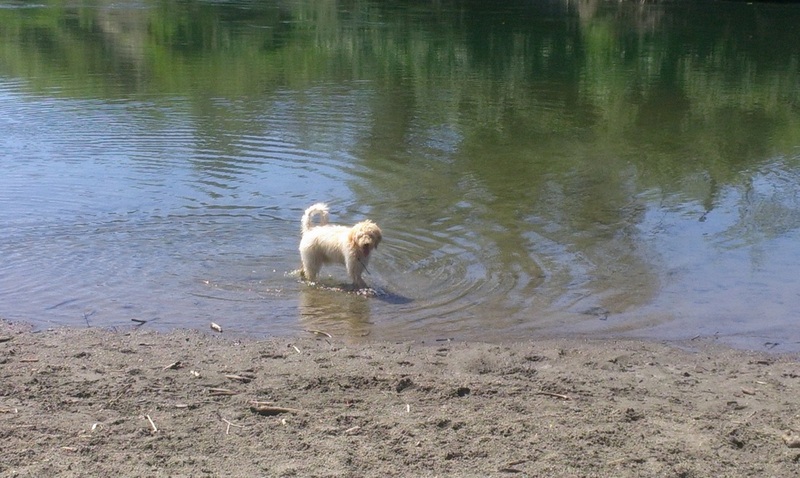 We live in Abbotsford, B.C., so we live by many lakes which Nahla loves. She is a great swimmer and will chase balls in the water and stick her head in the water to retrieve a ball. Her personality is just so sweet. Her favorite things to do are: going for runs, walks, tug of war, stealing our other dogs toys, hide-and-go seek, tag and cuddling. She cuddles with you when you aren't feeling well, tired, or need some cheering up. We have another dog with who she will never part with and loves to play with. Thank you soooo much for our sweet pup. on many walks and learning to chew frozen carrots and chew toys rather than us and our furniture! Her friendship with the kitties is icy at best, but is warming daily. 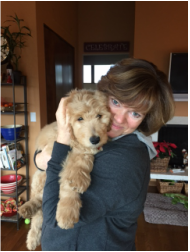 Thank you Annie for our sweet Goldendoodle Lily. 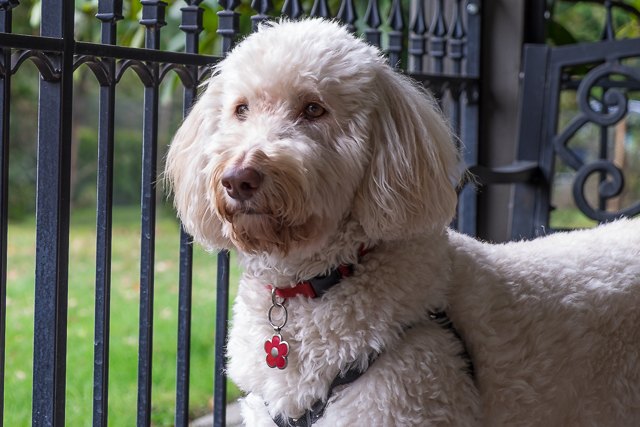 She is an F1 goldendoodle and is incredible. My husband and I take her everywhere and we constantly get compliments on how beautiful she is. Everyday we look at her, we can't get over how cute she is. Lily makes us laugh so much and she is such a part of the family. Whether she is watching TV, fetching her ball in the ocean, swimming, camping, cuddling, or sitting under our feet at a coffee shop, she is just amazing. We recommend Annie's Doodles to anyone who is looking for a beautiful, well-tempered family dog. God Bless you too Annie and have a wonderful Christmas with your family! Thanks for everything Annie - Sounder is a joy to have around. 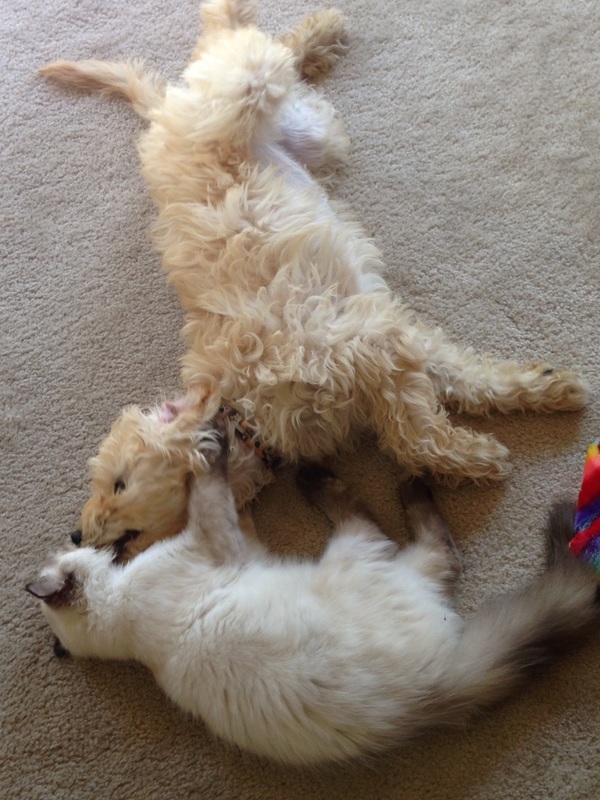 This is Ella’s buddy, Roxie is only 4 weeks older than she is! 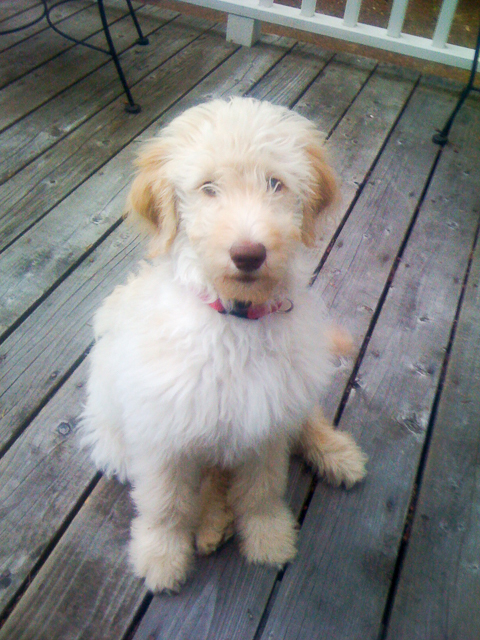 Just a little picture of Sugar our goldendoodle. She is doing well. 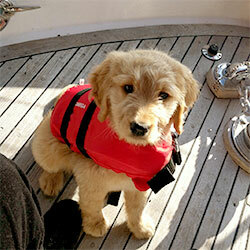 She is a wonderful goldendoodle. We enrolled her in a dog day camp that she goes to on Thursday's to socialize with other dogs. The camp also has some private land that we are allowed to go to walk off-leash whenever we want to take her - right along the river, so we went there today - it was hot out! 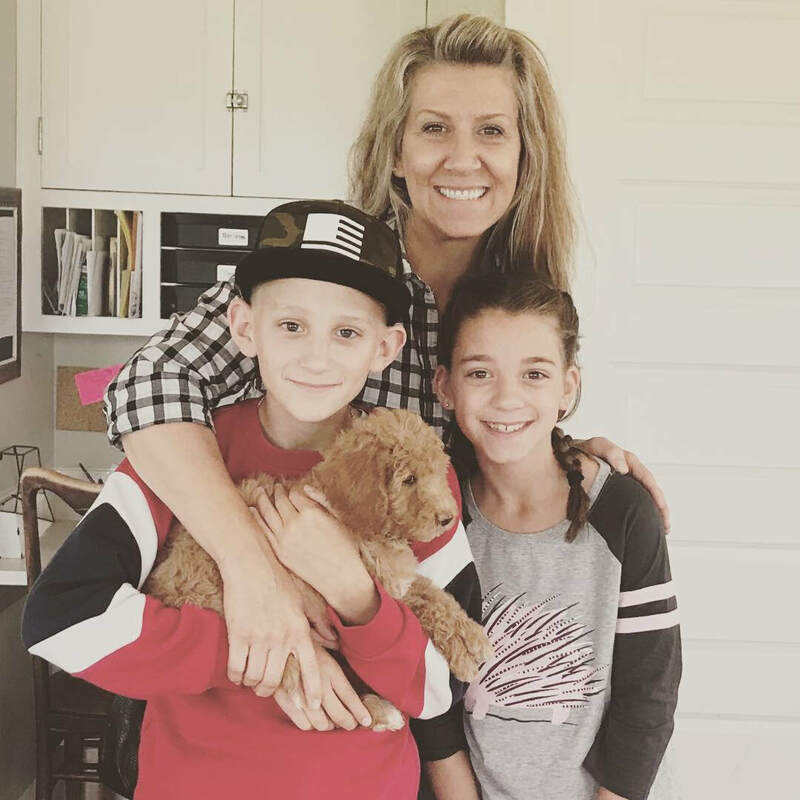 Tomorrow we are having a dog whisperer come in to share with us anything that Sugar might want us to know that we are not getting, and to give us tips on the best way to help Sugar and our daughter interact. Things are going okay, but we are just wondering if they could be going better. Thanks so much for her! 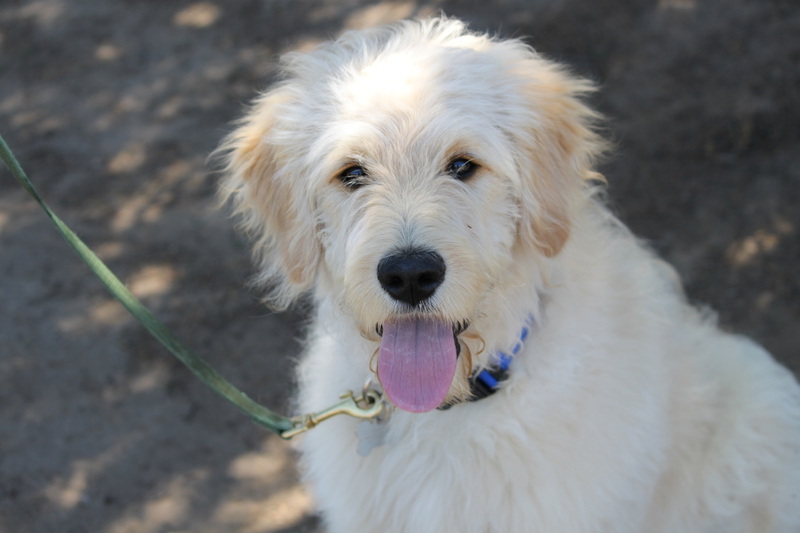 Here are some pictures of Bernie our goldendoodle. He weighs in at about 56lbs. right now, very pleasant, good demeanor, and fun to play with...he is loved by all. He loves his morning walks he is up and ready about 4:30 or 5:00am everyday then sleeps upon return and fires up once school gets out and the kids are home. 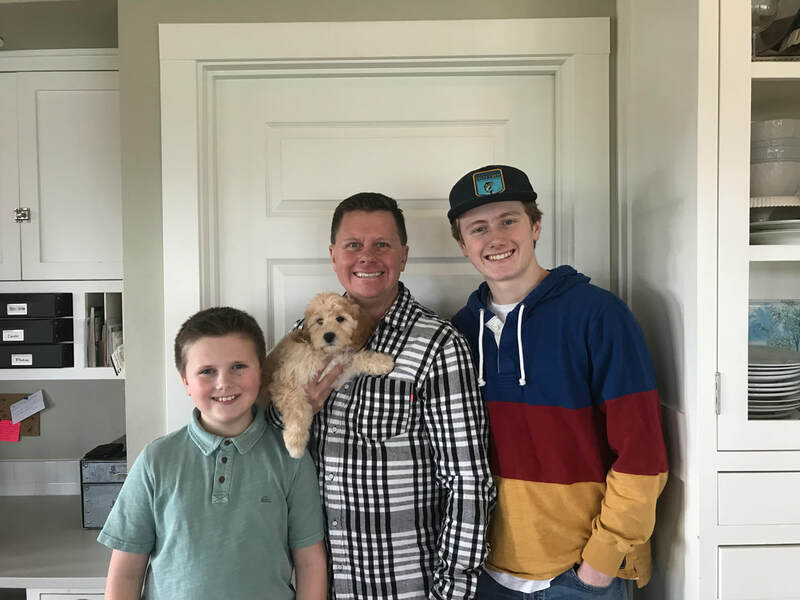 He has been perfect for our family, he is bonding well and fitting in great. Thanks again he has been a great addition. These where taken at the beach in Grayland Washington, our first camping trip. 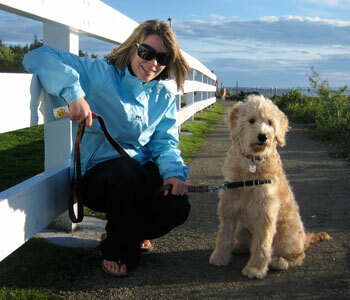 Ella is a super intelligent goldendoodle girl, she has already learned some basic commands like sit, come, stay. She is super friendly and extremely cute we get mobbed every place we go. 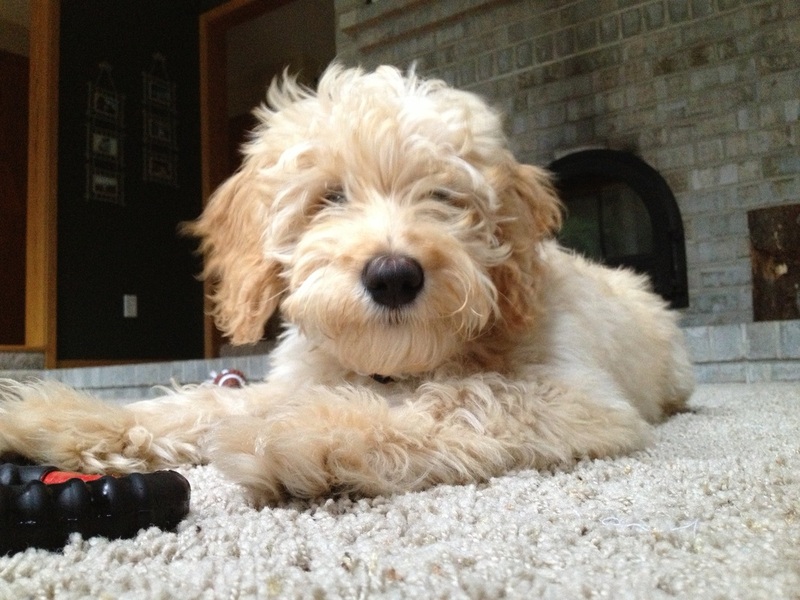 Which is typical for goldendoodles. I’m enjoying her immensely. 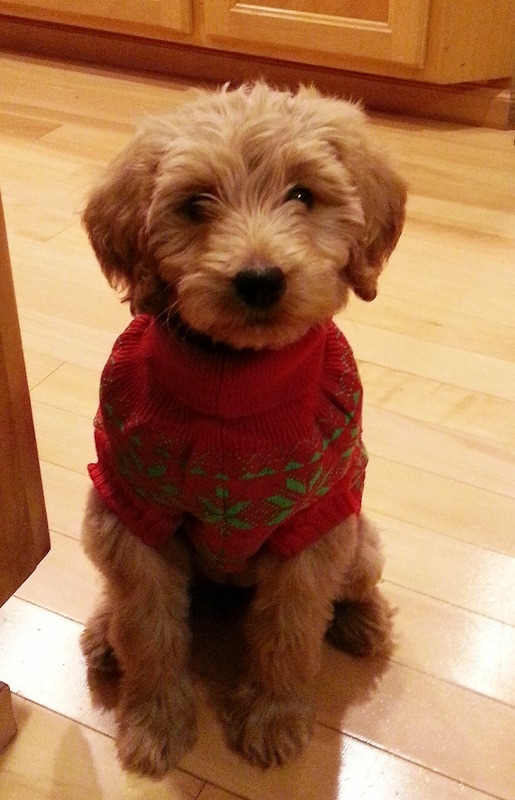 Brodie is a goldendoodle full of life and brings a smile to our faces. He is a great companion and loves to cuddle (loves to climb into our laps). Wherever we go, people want to pet Brodie and are surprised by how soft he feels. Brodie also loves hanging and playing with his day care buddies - human and four legged. He sure loves a good game of chase with his four legged friends. Thank you Ann, for our Brodie boy. We just got back from a family vacation at the ocean yesterday. 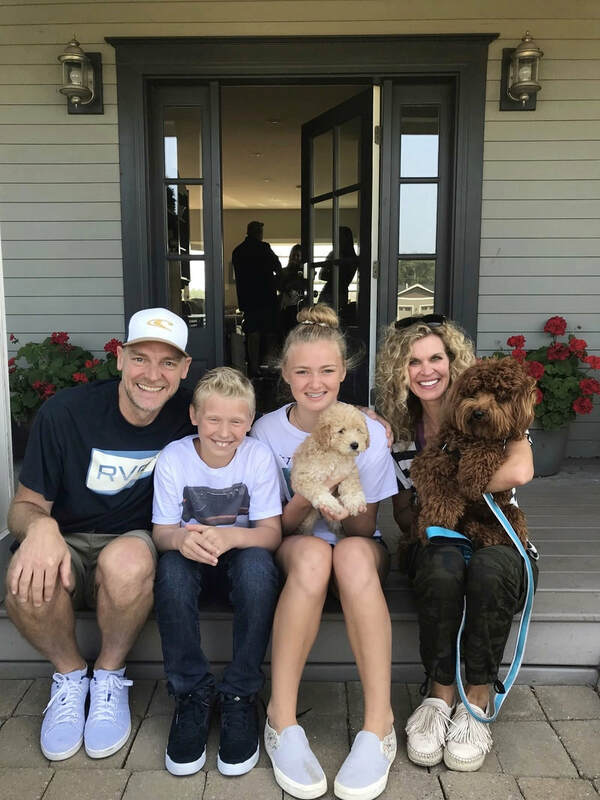 On my mom's side of the family there are 7 dogs total, Maggie our goldendoodle gets along with all of them, and met some new friends at the beach as well. She wasn't sure about walking near the surf, but she loved to splash around in the creek. She knows most of the basic commands and is familiar with her name. When we go on walks, people find themselves drawn to her sweet personality. Maggie also has a friend that is from one of your past litters, his name is Barney and is a little over a year old, he is actually the reason we wanted one of your puppies. 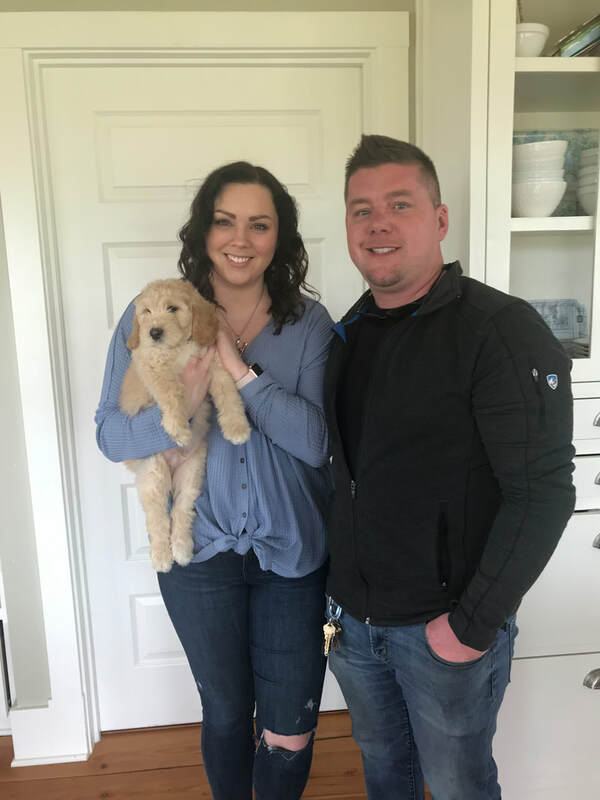 First, Joe and I want to thank you for the fabulous goldendoodle puppy we received from you. He's been true blessing and brought us a ton of joy. A picture of Jameson is attached below. 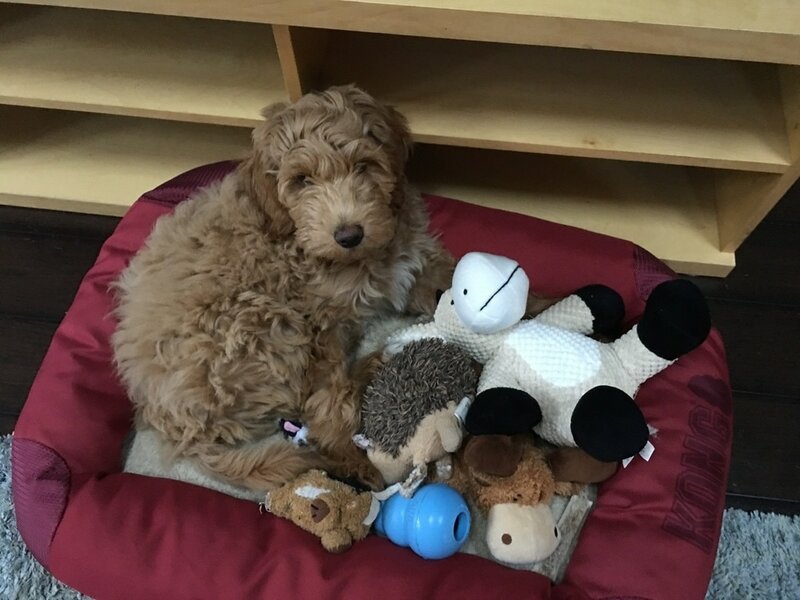 We are looking to get another puppy in the spring of next year, and we were wondering if you have any multigenerational australian labradoodle litters planned for that time frame. I hope you and your family are well, and we look forward to hearing from you. 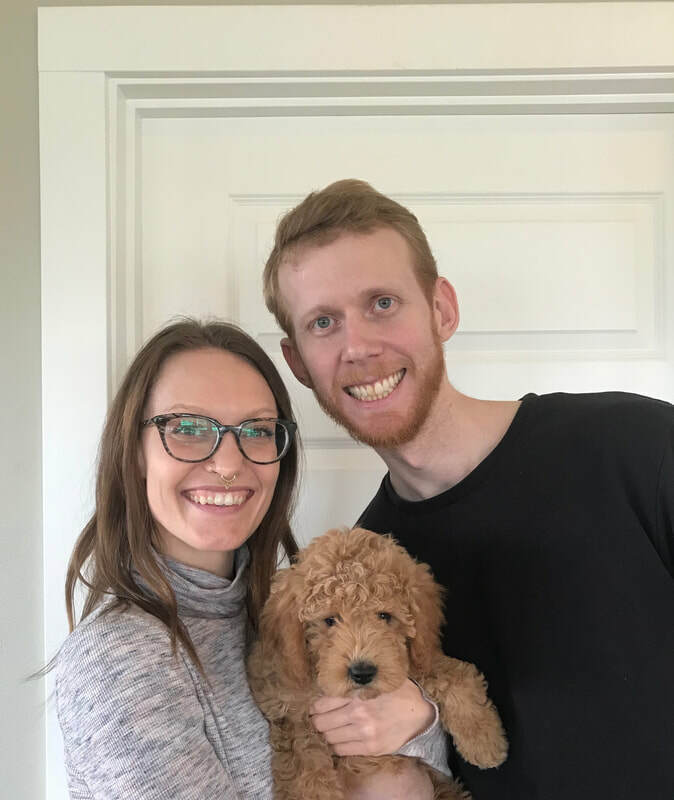 Our Australian Labradoodle pup that we got from you, Salter, is everything we wanted him to be and more. We are considering even getting another! 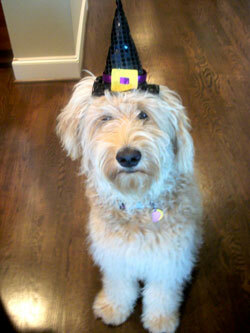 I wanted to send you a quick note to say how lucky we all feel to have Salty, our goldendoodle, in our home. She is such a sweet puppy and we are all having so much fun playing with her, watching her grow and having her a part of our family. 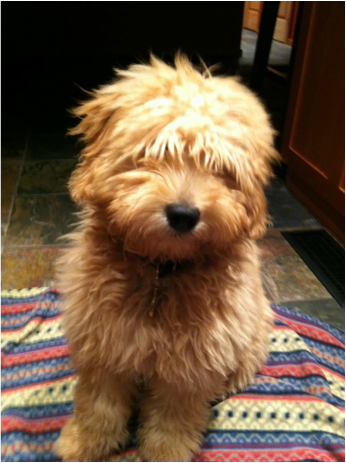 Toby is almost six months old, and we cannot imagine a sweeter, more lovable puppy. 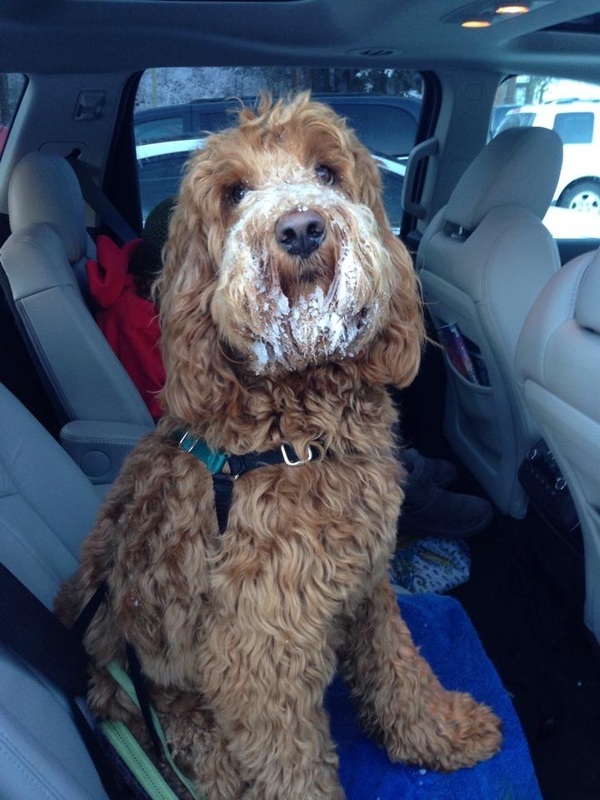 It sounds odd, but other dogs, even other doodles, simply don't have his sweetness. He's joyful without being hyper, and he has smarts as well as the desire to please. It's amazing how much our family laughs at anything Toby-related. 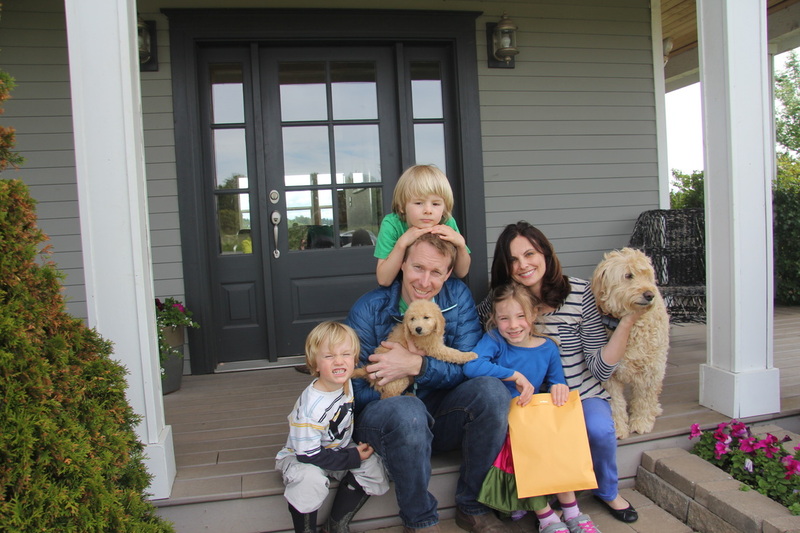 In fact, he adds a richness and a joy to our family that we didn't even know was missing. When he wags his tail, his whole body wags. 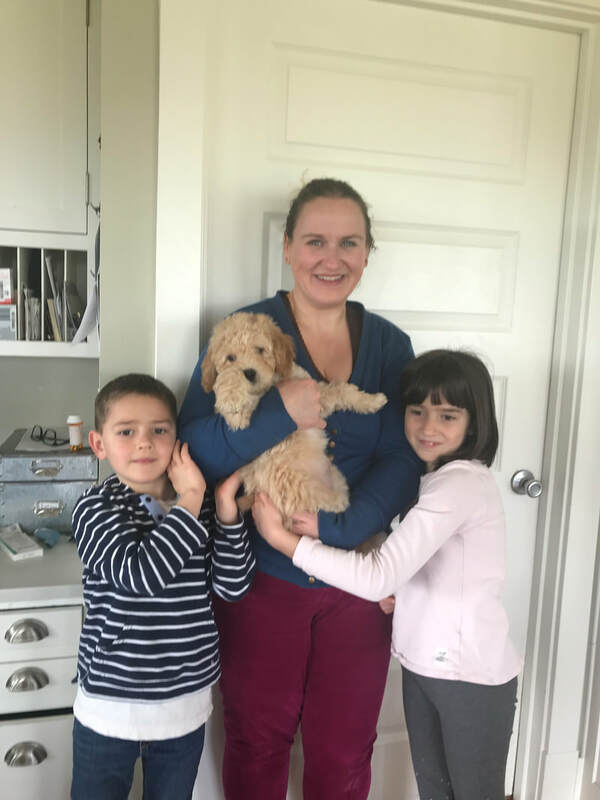 Lucy, the wonderful goldendoodle that we picked up from your home in 2009, is such a marvelous companion, family member, and addition to the larger community that we just had to write and let you know. 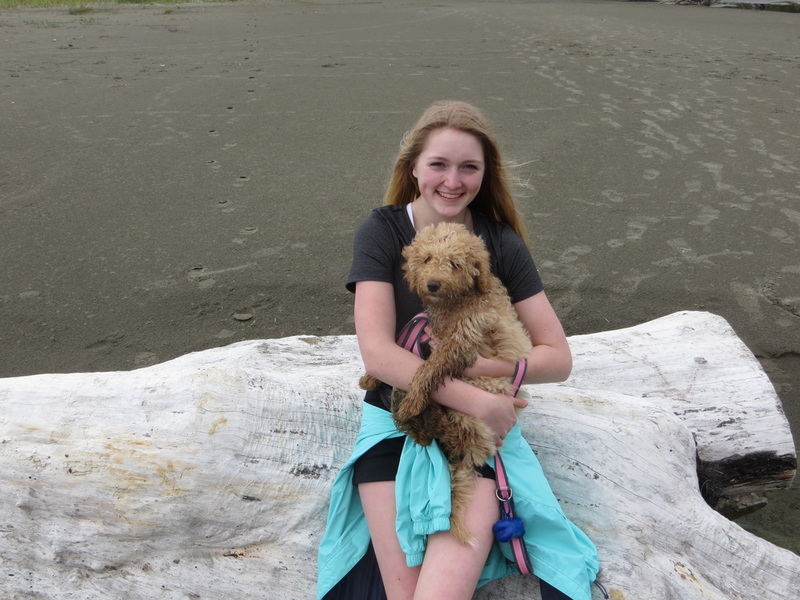 We brought her home to Whidbey Island where she learned to love the beach, made lots of friends at the dog park, and romped after squirrels, rabbits, and deer on our six acres of woodland. Then we moved to Kirkland--to be closer to some of the grandchildren. We thought she would miss all the property we had on Whidbey, but she took to the change like a champ. 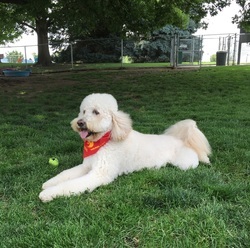 In fact, she enjoyed meeting people in the park, in "downtown" Kirkland, or in ACE hardware so much that I decided to try training her for therapy work. 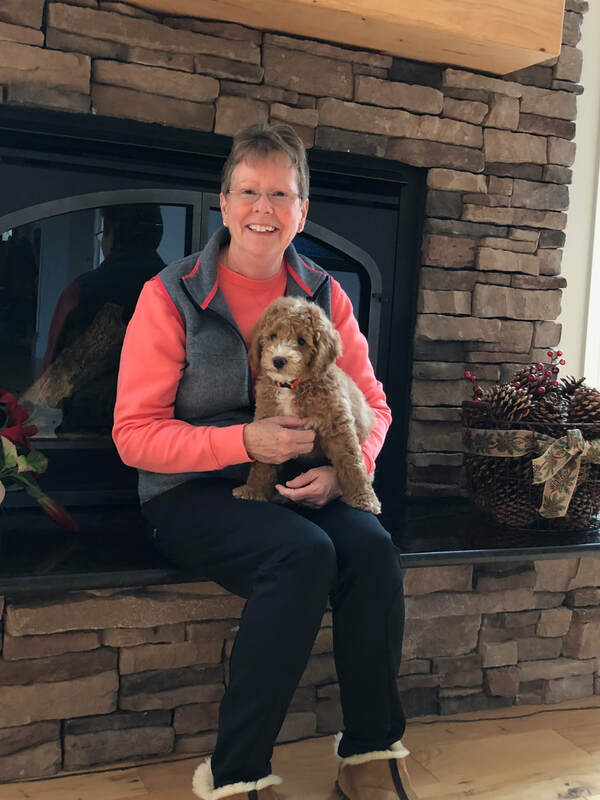 After classes, testing, and certification with Pet Partners, Lucy and I began as a therapy team at Swedish Hospital in Seattle. 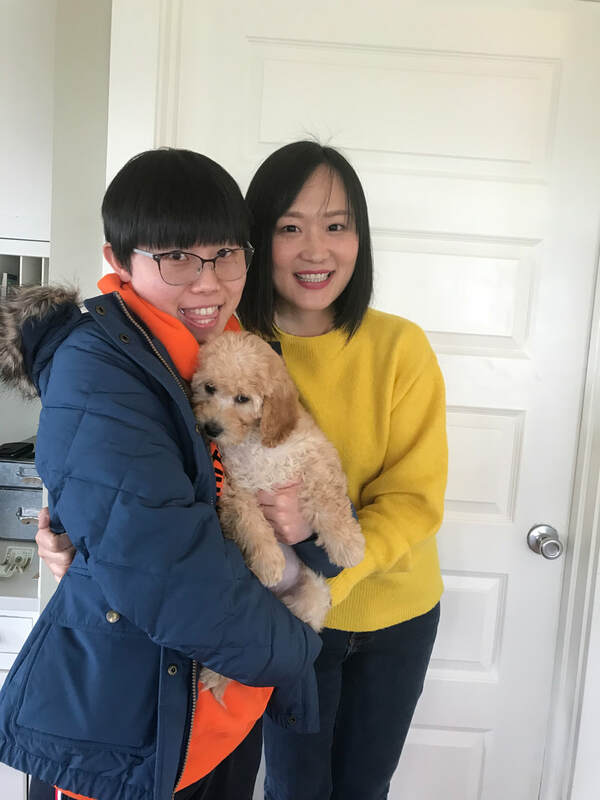 Every Tuesday, she delights patients, their families, and the staff with her cheerful attitude, eagerness to please, and her oh-so-soft curly coat. We visit patients on the rehabilitation floor--people who have had strokes, amputations, spine and brain injuries that require weeks of physical therapy. They can't wait for Lucy to arrive. She wags her tail, looks at them with her bright eyes, and does a few tricks to make them smile. They shed tears, they laugh, they pet her and hug her, and they all tell me that she is a welcome change in their tiring days. She gives them a chance to think about something other than their problems, and often they talk about their own dogs. Lucy puts in three hours like it's no big deal, then comes home and sleeps 'til dinner! 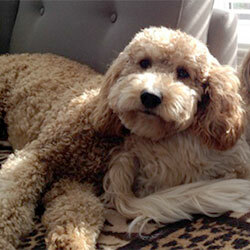 She does truly seem to love the work--and you can be very proud of the goldendoodle that you have bred. People ask me often where we got Lucy, and I send them to your website. I hope that they have been as happy with their golendoodles as we are with ours. For us, Lucy is the dog of a lifetime. We really can't thank you enough. Attached please find photos of Lucy long ago, and Lucy last week. 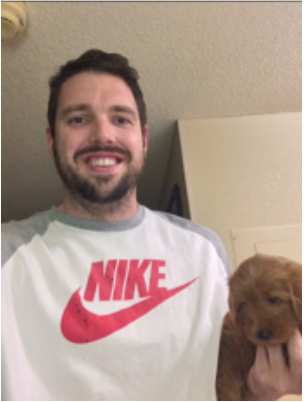 After picking up Charlee (F1B Goldendoodle) on pick-up day, she rode shotgun with me all 700 miles from Ferndale to Sacramento. I couldn't have asked for a better riding partner. 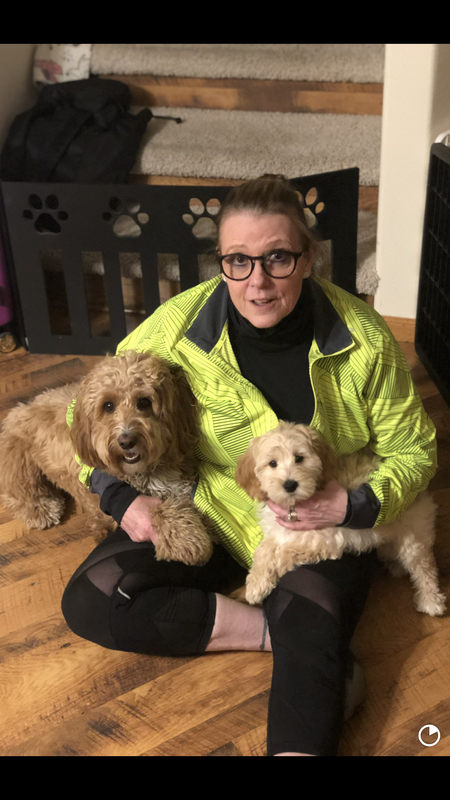 We enjoyed quite a bid of bonding time, and it made me very confident that getting a pup from Annie's Doodles was an excellent decision. We've been back to Sacramento for 3 days and she has brought me nothing but joy and fun. I get text messages from my entire phonebook asking for daily photos, and believe me when I say her cuteness never disappoints. 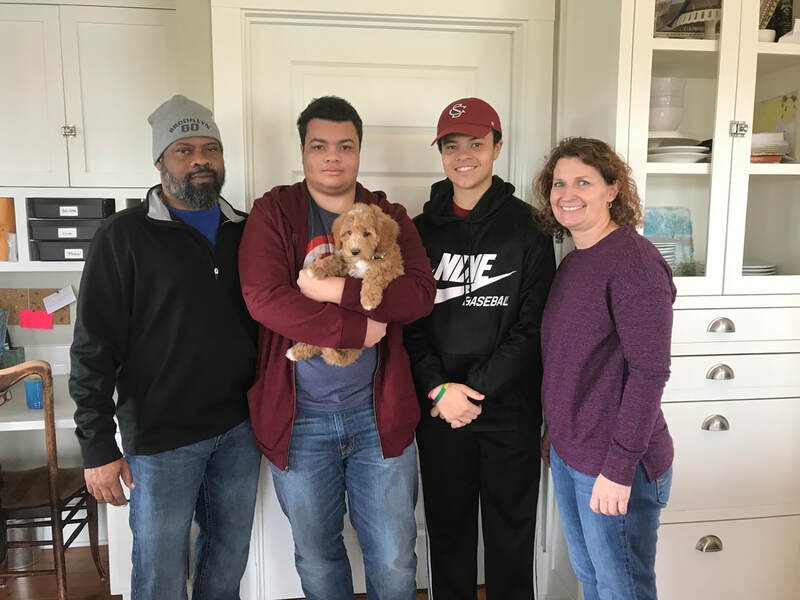 I would recommend Annie's Doodles to anyone looking for a comfortable adoption experience and a great new member for their family! 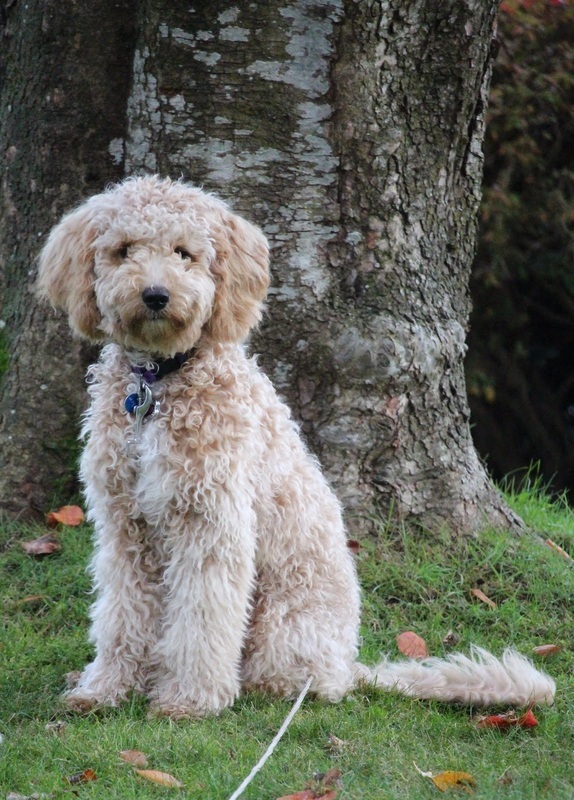 We got our puppy from Annie’s Doodles four years ago and she is truly a wonderful dog. 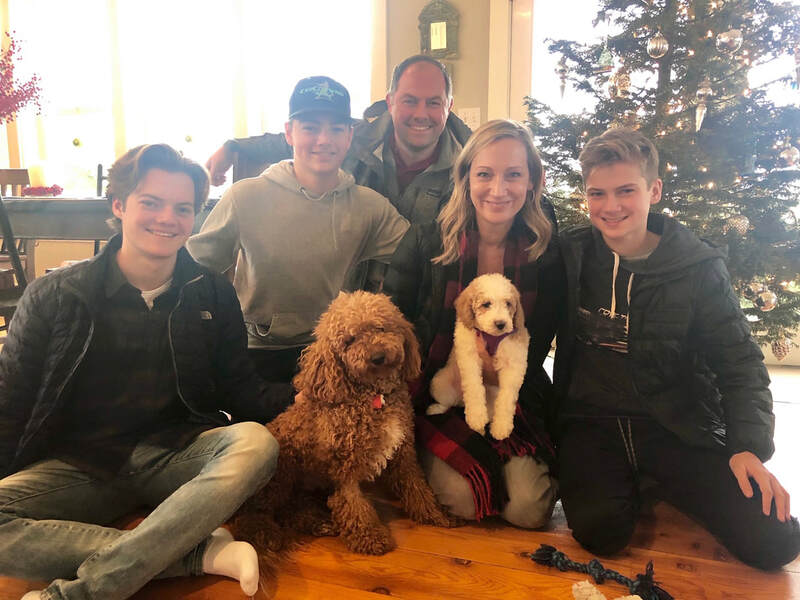 Annie’s adoption process is not conventional, but if you trust her (and you should - she is a longtime breeder with a beautiful facility and top-notch dogs), you will most likely end up with the best dog you’ve ever had. She doesn’t allow many visitors because their utmost concern is for the health of the dogs. Very happy with our experience there. Jackie M.